The 14th edition of the Asia Contemporary Art Show will open on March 29th at the Conrad Hong Kong. 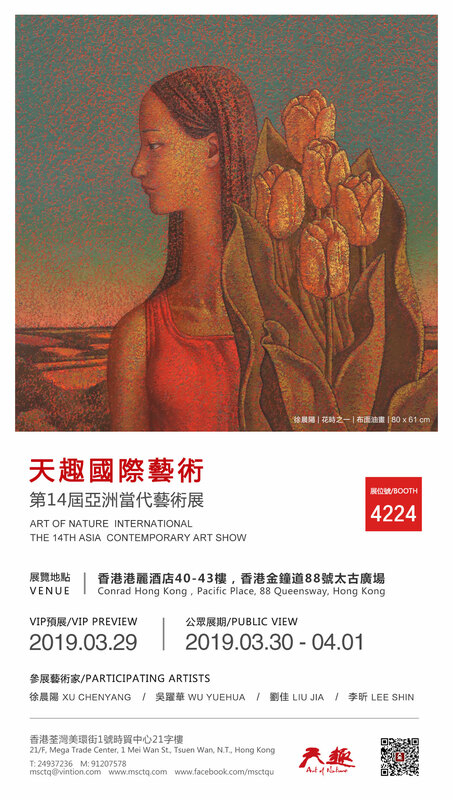 Art of Nature Contemporary Gallery proudly presents diverse artworks by Xu Chenyang, Wu Yuehua, Liu Jia and Lee Shin, bringing a fascinating art feast for all collectors and art lovers. Xu Chenyang’s oil paintings pay more attention to the ideology of the content, the texture and implication of the color, aiming to achieve simplicity and intensity, and to convey tranquilityand modesty. Affected by Impressionism and expressionism, Wu Yuehuauses blocks of color to run through the picture and creates a dreamy and dramatic style. Liu Jia’s artworks are elegant and simple, she imitates the ancients in painting and incorporates with contemporary aesthetic ideas, with rich thoughts. Lee Shin showcases the passion of life, not only the uninhibitedness of dancers but also the flow of floating consciousness. Let us gather at Conrad Hong Kong in this Art Month, enjoy the beauty of art and have a great weekend! Remark: If you prefer not to receive further product information from us, please reply to this email with the subject "REMOVE"